Mozart was the first major composer to compose a clarinet concerto, but Weber runs a close second. Written a generation after Mozart, Weber's two clarinet conceri hold a similar place in the repertoire. 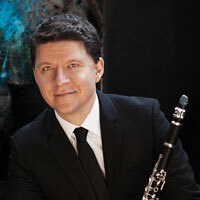 Clarinetist Alexander Fiterstein brings out those similarities in this new recordings. His liquid tone and precise intonation bring a classical elegance to these works -- a touch Mozart might appreciate. Yet Fiterstein nimbly leaps about, almost dancing with the music. Perhaps its appropriate then, that he should be accompanied by a ballet orchestra, then. The San Francisco Ballet Orchestra, directed by Martin West provide a light and transparent ensemble sound that further strengthen the similarities between Mozart and Weber. That's not to say these are pretty performances. Fiterstein and company provide plenty of drama and weight when required to -- especially in the second concerto. On the whole, appealing and inviting performances of these familiar works.